It has been a while since my last post, but have patience. I find it is hard to buy stuff when money is scarce. I work part time, but desperately want to work full time. It just isn't out there right now. Well, it is, but those positions fill up quicker than I have ever seen in my time. I didn't appreciate that the instructions that came with the parts didn't explain much so I stared at the parts, which doesn't usually work, but my brain was working extra well that day and I was able to figure it out. Since the instructions for each part were barely instructions I did my best at explaining what to do in the following directions. There are quite a few things that can go wrong with a toilet. The flapper is an easy repair, as well as the handle and lever. 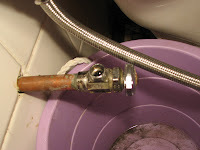 If the flapper needs to be replaced: turn the water off to your toilet, flush the toilet, slip the flapper out of its holdings, bring it to the hardware store to make sure you buy one of the same size, slip the new one in place and hook the chain up to the lever, turn the water back on and let the tank fill up, flush the toilet to make sure things work well, if everything works the first time then you are done, if not, maybe there is a leak somewhere else or maybe the chain has too much or not enough slack. For the latter-adjust the chain accordingly by one or two links at a time. It does us no good to move the chain links up or down too quickly. A job well done was done with careful thought and by trying different things until the needed end result is accomplished. For possible leaks elsewhere...that's what this post is for. Before getting started, read all the directions here so you can make a list of things you need to get at the hardware store. Nothing makes a project seem like it takes a long time more than making several trips to the store to buy and return or exchange things. If the lever or handle is your concern, unscrew the big bolt and pull the handle out, insert new handle and screw it in. In the same way you can remove the lever. Just make sure you unhook the chain from the flapper, but shake it off and laugh if you forget this step. Luckily it's an easy fix. Levers used to be made of metal, like steel for example, but since metal corrodes when in or near water, they are now made of plastic. Plastic takes thousands of years to degrade so a plastic lever should last your lifetime, but they can break or snap. Make sure you recycle what can be recycled. Even things you would think can't be reused or recycled actually can be. They may be made into a completely different item like floor mats (mostly indestructible, too!) or shoe soles. Please Please Please recycle. The following goes beyond those repairs, but not behind the wall or the floor. I recommend cleaning your toilet inside and out and sweeping and mopping the floor as pre-prep. If you use a cleaner that sits in the water tank, know that you will have a mess on your hands when you go to empty the tank of water. I had one that was safe for the environment in my tank. It was like jelly and felt really weird in my hands. I used my hands to scoop it out and I put it in the trash can instead of the sink. If you have kids, this can be a great time to have them help you. Boys especially will like the feel of the messy blue stuff. Kids love to help until a certain age, then you have 10 to 15 years of no help or fights before helping, then they usually want to help again when they are adults. I enjoyed helping anyone as long as it wasn't my own family. One thing you can do for the kids when you want them out of your way is to lay large posterboard on the floor and let them play with the gunk as if it's finger paint as long as it doesn't have bleach or harsh chemicals. Maybe put a small tarp or drop cloth under the play area so you don't stain anything blue. To prepare: get some old towels. As many as you feel like. I used one at a time because I don't have many crappy towels, but things would have gone faster if I had more, and you will need a bucket. A large and wide bowl should work just as well if you don't have a bucket. The water you will be catching is clean, it's the same water you drink, make coffee with, cook pasta in...You won't ruin anything you use by catching water so don't be afraid of using a bowl you use in your kitchen. Since I don't have many towels, I used a mug that would fit in the tank with the other stuff already in there. After flushing and before using towels I got as much water out as possible and emptied it with the flapper held up. Tools needed: Flat head screw driver (check the screw head inside the tank to verify the type of screwdriver you need, but a flat head will be fine), a wrench and maybe a set of pliers in case you work better with one tool or the other, putty tape, and scissors. You can tear putty tape, but you end up with a lot of waste so use scissors to cut where you want to and you won't have annoying strings of putty tape getting in the way of anything. You also need a saw. Nothing too big, a hack saw is perfect. It isn't good to use any sharp object on more than one thing, but if you don't have many tools you can use a dry wall saw. Or maybe you can spend a little money on a new tool and in the end save a lot of money by not shortening the life of your tools. You can also check freecycle.org for your area. If you need to cut the water pipe, then you also need a pipe cutter-check the diameter of the pipe to be cut. Most copper pipes are .5” so a cutter with ranges of 1/8”-7/8” is what you need. ~Turn the water off for the toilet. Not the whole house, just the toilet. In the plumbing industry, this is called the shut-off valve. 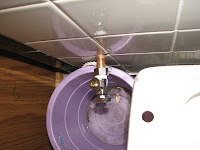 ~Flush your toilet and hold the flapper up so as much water as possible can drain out. ~Place some towels in the tank to soak up the rest of the water. I had to use one towel so after quickly getting out what I could with a small mug, I let half the towel soak in water and wrung it dry in the sink. Be careful not to let the towels sit too long. More than a day and they will grow mildew. When you are done with the repairs or you are done for the day, either hang the towels so they can dry or go ahead and wash and/or dry them. When you have all the water out, you can begin unscrewing things. 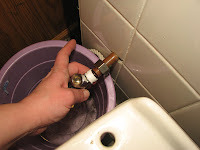 ~Unscrew the flexible pipe at the toilet, it comes from the water pipe sticking out of the wall. Place the bucket or bowl so water doesn't drip on the floor. ~There are two screws at the bottom of the tank holding it to the toilet. You need a flat head screw driver to hold the screw still and you need to remove the nut and washer on the other side of the tank. I should mention some of the positions you need to assume are awkward. ~Use the wrench or pliers to grab and unscrew the nut while holding the screw still with the screwdriver and try not to damage the nut. 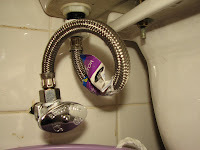 Instead of a screwdriver, I used pliers to hold the screw still: there should be a space between the tank and the toilet where the screws are and I slid the pliers in to grab the screw and the wrench undid the nut, but this won't work if the nut and screw were too tight. You don't want to strip the screw's threads, even though you don't need them at this length on the screw, and you don't want to turn pointlessly, not getting anywhere in your project. ~Once you have the nut loose, unscrew the rest of the way with your fingers. ~Locate the bolt and nut on the other side of the tank and repeat the last two steps and also do what you have to do to get them off. ~Look the screws over to make sure they are worth reusing. They most likely are, but it's best to be safe. At the head of the screw is what keeps water from seeping out from the tank through the screws' holes. If it looks dry rotted, go buy a new screw (or set if they both look bad). ~Now you should be able to lift the tank from the toilet. Be careful and place it on the bathroom floor. 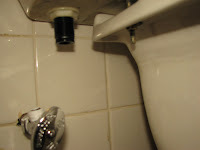 with the tank off of the toilet, there should be a seal of some sort either covering the threads and [tank-to-bowl] gasket or sitting within the large hole in the back of the toilet. Make sure this seal is not dry rotted. If you need to, take it with you to the hardware store to pick up a new one. ~Unhook the chain from the lever arm and unhook the hose to the valve pipe if there is a hose. ~Unscrew the huge gasket on the under side of the tank and pull out the old flush valve. I like to remove everything before putting the new parts in, but in case you don't work like that or this is the only repair you need to make, I will keep this in order of the part we are working with. ~Don't throw anything away yet. You may need to reuse the gasket so I am mostly speaking of that particular part. A side note: I call the flush valve “the thing with an open pipe.” In the industry it is a Toilet Flush Valve. ~Wrap some putty tape around the threads of the pipe at the top, which will be near and at the tank. You are creating a seal for the gasket so no water can get through. Wrap in about three layers and press down slightly with your fingers. Putty tape is easy to mess up, it is delicate stuff so handle it with care. All the same, don't get frustrated if you do mess up what you are working with. You can't get work done well if you are upset. Just get some more on the threads and move on. It can help to have some music on to keep the brain from thinking too much. Mine wanders and I think of negative things some times so I always have music on. ~When the top of the over-flow pipe (of the flush valve) is about an inch from the critical level line, you can install the flush valve. If you didn't put putty tape on, do it now. ~With the tank on the floor, screw the gasket on the threads of the pipe while pushing on the flush valve mechanism from inside the tank. You need to get this seal as tight as possible. This is why it was probably hard to get the gasket off earlier. I didn't have mine as tight as I could have, apparently, though I Really thought I did, so I had to empty the tank and remove it all over again to screw the gasket maybe 1/8th of a turn. That little turn was all I needed for my installation to not leak. Make sure the big soft seal is covering the gasket when you set the tank on the toilet. 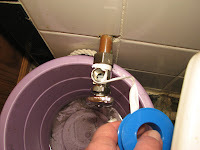 ~If you only need to replace this part: reattach the hose to the overflow pipe and reattach the chain to the flush lever arm, attach the tank to the toilet (two screws inside, one washer and one nut on the other side of each, washer goes on first, then the nut, go as far as possible on your own, then use tools to seal the deal, don't screw too tight or you can break the porcelain), reattach the water hose to the bottom of the tank (which is the other side of the fill valve) and turn the water back on. Let the toilet fill up, flush it and make sure there are no leaks. You now know how to remove the tank so if you have leaks, keep repeating the steps to remove the tank until you get the seals right. It's tedious and maybe annoying, but saving money is not annoying, or is it just me? ~To replace the flush valve: Don't attach the tank to the toilet and don't attach the hose from the flush valve to the overflow pipe. 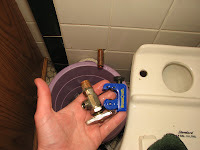 ~Unscrew the gasket (I call these things really big nuts) and pull out the flush valve. 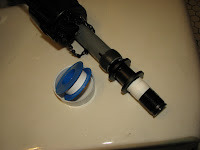 ~It may just be that you need to add some putty tape to the threads and you can keep using the current flush valve. Either way, that's what you do for the new or the old. ~Wrap some putty tape around the threads close to the top of where the threads are so when you have the fill valve in the tank you want the gasket to cover some of the tape. The putty tape is there for the gasket, but it's okay to have some putty tape on the threads above the gasket. You want to wrap so that you have three or more layers, but three should be enough. ~Make sure the critical level mark of the flush valve meets up with the critical level mark of the toilet. 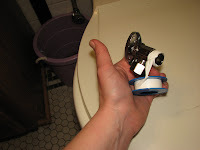 The flush valve can be adjusted up or down according to the instructions that came with it. Mine twisted and locked, but I don't think they will all work like that. 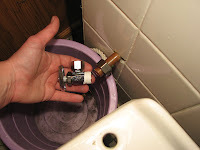 ~When the critical level marks on the flush valve and the toilet match, begin screwing the gasket onto the threads while pushing on the flush valve. This seal needs to be as tight as possible. I used a wrench to help me get it tighter and thank god because I screwed it a lot more than I thought I could have. ~Reattach the water hose to the bottom of the tank (which is the other side of the fill valve) and turn the water back on. Let the toilet fill up, flush it and make sure there are no leaks. You now know how to remove the tank so if you have leaks, keep repeating the steps to remove the tank until you get the seals right. ~To drain the pipes, turn on some faucets as if you are to use them and let them drip. 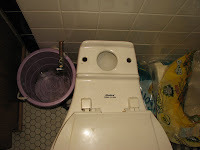 ~Flush your toilet and unscrew the pipe coming from the toilet and let the water drain from the water pipe. ~Keep a bucket under the pipe while it drains and leave it for a little while. I left it for only about 10 minutes because I don't mind getting a little wet. ~Your pipe is most likely no more than ½ inch thick so you should get a pipe cutter for half an inch to a full inch. Move the cutter around the pipe, cutting a circle into it. ---The picture shows the pipe cutter I used (the blue thing) and the section of pipe that was cut off. The valve was soldered on so I had to cut it. If you have a compression valve then make sure you don't just need to check the seals and apply new putty tape---Pipe cutters work differently, but if you don't plan on using a pipe cutter all the time, you can get the cheapest thing which probably works like this: fit the cutter over the pipe, tighten the cutter by screwing it tight onto the pipe, tighten as you move the cutter around the pipe (I tightened it every 1/8th or 1/10th turn or else it slipped off) until the section of pipe you want removed comes off. ~Allow more water to drain from the pipe while you clean the debris from it. You won't get a good seal for the valve at the pipe if there is debris in the way. I used a towel by twisting it and pushing some into the pipe, turn it in one direction while pulling the towel back out. Don't let this part of the towel touch the pipe, keep the shards of metal away from the work area and also from you. Metal splinters can be removed as wood splinters are. Use a different area of the towel to rub around the cut area of the pipe and use a different section each time you clean debris for the seal. ~You will most likely use a compression valve so either bring the hose that attaches to the tank with you to the hardware store or bring the valve you removed along so you can be sure you get the right sizes. I had the wrong size hose/pipe so I had to go back to get another. I let my husband go so I could finish other work on the toilet and they wouldn't let him return the pipe we originally bought because “it was already returned.” Huh? No. It was not. Obviously. I returned a flexible wrench and a valve that required soldering. Not a pipe or hose. ~To solder a valve onto the pipe, you will have to have all pipes clear of water and any droplet of moisture or you won't have a good seal so get a compression valve. 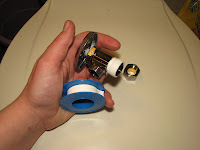 ~Wrap some putty tape around the threads on the compression valve. I don't know how much I used, but it was more than three layers. It was either 4 or 5 layers. ~With the valve open (the knob turned counter clockwise/lefty loosey), begin tightening the bolt on the valve. The package said to tighten an 1/8th of a turn beyond where it bites (screwing further by hand becomes hard) with a wrench, but that wasn't nearly enough for my pipe. I recommend doing it how I had to because you Do Not want to over tighten. So, after screwing the valve as tight as it will go and then about an 1/8th of a turn beyond that with a wrench, turn the water on for the house and check the valve for leaks. Turn the knob on the pipe so you turn the water off. 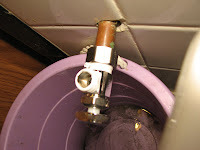 If water is not leaking from the joint (where the valve meets the pipe) then you are done and you can attach the hose from the toilet. If it still leaks then turn the water off for the house and keep tightening the valve onto the pipe until you don't have leaks. At this point, you shouldn't need to turn the water off for the whole house, you may be able to just turn it off here and tighten until you don't have water leaking. The main issue I had was that when I tightened a nut or a gasket, I tightened until I couldn't any more, I went on to use a wrench and I was able to go much further than I should have been able to. This, again, might be due to my being sick and immobile for so long. If you happen to tighten beyond where you should have and you break something simply turn the water off so you don't waste any, regroup (take a break, eat lunch/dinner), and head to the hardware store to replace what was damaged. You can call the hardware store before going to find out what you need or what you need to know before buying a new whatever it is you need to make sure you only make one trip. If you keep tightening and turning the water off and on, well that isn't an issue, it's just annoying and tedious. Keep at it and you will be happy with your results and thus you will be happy with yourself. It's hard getting the pictures to line up! I am yawning too much and I can't think straight so I will work on getting the pictures straight another time.